I came across some RGB LED’s the other day on oomlout (http://www.oomlout.co.uk/5mm-rgb-leds-super-flux-x3-p-203.html) and wondered what I could create with them. Having been a light jock in the past I decided I’d like to create my own little lighting show (to be possibly used as part of a larger project in around 12 months time… watch this space). I secured 12 for the price of £9.72 including delivery and they turned up within a couple of days. I quickly set to work mounting them on their own little PCB with current limiting resistors & header. // All values are inverted. We'll need to deal with this later on. Here’s a quick video of the test in action. You can tell that the LED is quite bright, as it’s saturating the image. I think the next stage is to encase the PCB’s in either hot melt glue or sillicone sealant, to afford them a little protection. Next up will be testing with the PWM shield, as soon as it turns up. I’ll be using Q Light Controller (http://sourceforge.net/projects/qlc/), and an Enttec Open DMX USB Interface (http://www.enttec.com/index.php?main_menu=Products&pn=70303&show=description) to control my little show. The MAX485 Transceiver chips arrived – in a GIANT box I might add – so I got busy soldering them into a piece of stripboard (that was a little oversized…) and wired them to the Arduino PCB. 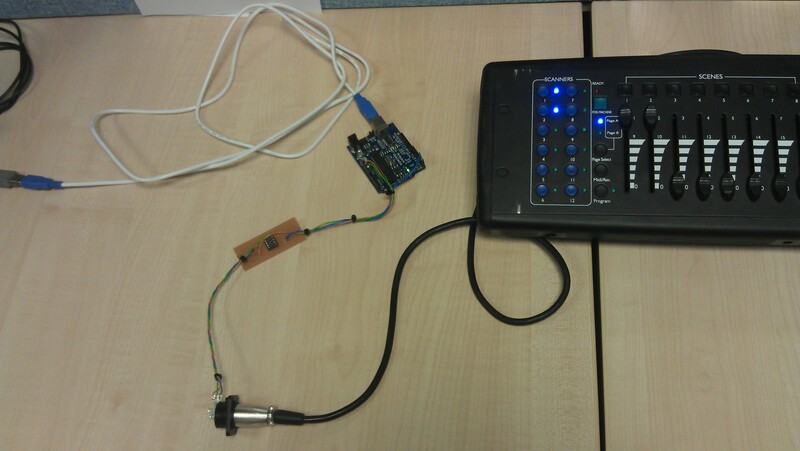 With a little code, and help, from http://blog.wingedvictorydesign.com/2009/03/20/receive-dmx-512-with-an-arduino/, I got the second part of the project up and running, namely receiving DMX. At the moment I’m just outputting to the serial console . But eventually the DMX values will be piped along to the LED’s via the PWM Shield, as and when it turns up. As the code from the blog above has been released under the WTFPL license (yeah, I had to look it up: http://sam.zoy.org/wtfpl/) I’ll be posting the finished code, but at this moment in time it’s pretty pointless due to the fact that I haven’t changed much from the original source.